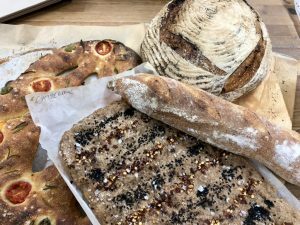 Well – I have just spent a most illuminating and enjoyable three days at Borough Market, learning how to make sourdough bread with the fine folk at Bread Ahead. The freezer is groaning with delicious loaves, a homeless man on the tube got a warm baguette, the local soup kitchen loves me for popping by with some spares, as does my neighbour who is promising to report back shortly with marks out of 10 for the goodies I took round to her. Yikes. I learnt so much that it’s hard to remember everything – I know I’ll need to keep practising to keep my new found skills up to scratch. Friends, you have been warned – if you come round to ours, there will be bread with everything henceforth. 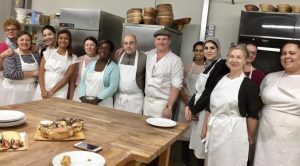 Under the expert eye of baker and teacher Kevan Roberts, we proved, rested, kneaded and baked for hours on end and produced some fine loaves. As those of you who know a bit about sourdough will understand, much of day 1 was spent getting ready for days 2 and 3, preparing starters, poolish and pre-ferment. We also managed to bake these gorgeous crispbreads and a rye loaf. I must confess to nibbling away at the crispbreads on the tube home – so tasty. Who cares about the strange looks from fellow passengers. I did as advised and managed to lay off the Borodinsky rye till evening 2 to give it time to mature (which it did and was great with a little smelly cheese, also from Borough Market). A downside of baking loads of bread is the risk of excessive cheese consumption. Day 2 – we made our own lunch. 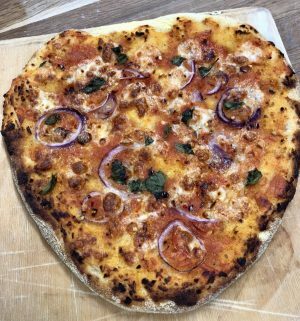 I didn’t plan to make a heart-shaped pizza – still need to work on my stretching technique… Another winner taste-wise though! 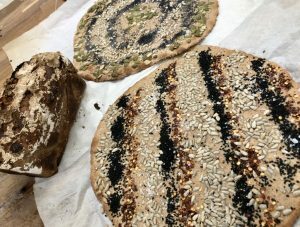 We also made: baguettes, sangak (a Persian flatbread), fougasse (a sort of leaf shaped French loaf) and this amazing no knead bread with fennel seeds and raisins. It’s time consuming but (don’t tell anyone else) pretty easy to make. Day 3 – we finished off our croissants. I had a bit of trouble making these look anything like the delicate little beauties Kevan produced but they are mighty tasty. We made a 100% rye loaf – which smells great and is awaiting more cheese before we tuck into that. We also finished off our levain loaves from day 2. 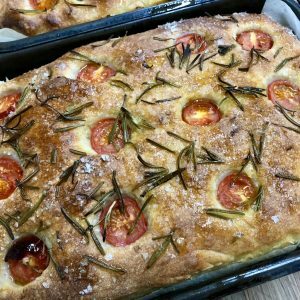 I couldn’t begin to pick a favourite bake, but there is definitely a sense of achievement in turning an extraordinarily wet mass of dough (no pictures of that sadly, but I can report that I am still picking bits of it out of my hair) into a magnificent focaccia – this was truly a taste sensation. I had the good fortune to be sitting next to the lovely Mary-Rose, who not only was excellent company for the three days, but also was visiting from Spain and was therefore unable to take most of the fruits of her labours home with her. She gave them all to me. It was a joy to spend three days with a great group of committed people, who shared the joys and challenges – we have videos and photos to remind us what to do if we forget. Thank you all for being such great company and Kevan – you were brilliant! Kevan was adamant that we must name our starters, on the basis that we are less likely to kill them off that way. 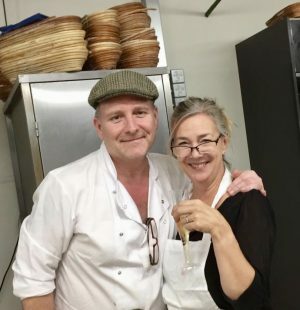 The Bread Ahead one, a little bit of whom is in all the loaves we baked, is called Bruce (after Canon Bruce Saunders of Southwark Cathedral, who blessed him when he was just a little baby starter). I now have an abundance of starter doing it’s thing in my kitchen – Sanchez, named for Mary-Rose who donated hers to me, Uncle Bryn, from Cardiff , a gift from my brother-in-law, and Lola, my very own Bread Ahead showgirl. 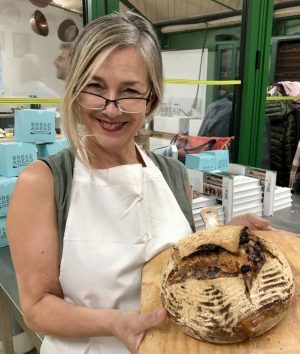 I am happy to share if any London-based readers would like to embark on the addictive sourdough journey. And the report is just in from next door: “Tomato soup last night with focaccia…bloody marvellous…so moist and oily and salty and rosemary-y…completely delicious. It was very oily and I wondered if it would be too much but NO…it was perfect. Scrummy indeed. Next up… it was no knead…and this was enjoyed with French butter and raspberry jam by me…and honey by H. Both of us scored it a 10!! Crispbreads with seeds and super dooper chili flakes, had with hummus…outstanding”. Ah I do love her. She did also say something about not being able to walk the dog due to excess baggage in the arse area, but hey, we all have to make sacrifices. I LOVE Bread Ahead and am so excited to be booked in for a couple more sessions in November. If you haven’t got time to take one of their courses, at the very least go and buy some of their wares at Borough Market. Do it, you won’t regret it! You are such a talented baker – and cook! You should definitely give it a try, the courses I have done have all been excellent. It would be great to catch up soon – do you have any time before Christmas, or is that unrealistic? ?